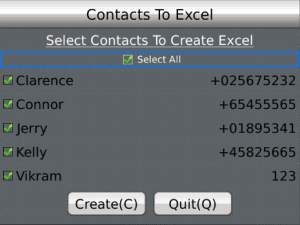 Blackberry does not support to transfer mobile contacts in excel but it can possible through supported Blackberry App “Contacts to Excel”. Download this app in you Blackberry Mobile. Click on Create Excel than wait for the processing, second window will be visible on your mobile screen. Press C key in your mobile than it will show you the total number of contacts in your mobile than press Yes to create a excel file. 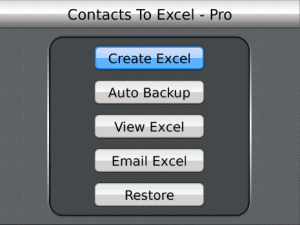 After some time message will appear Excel Created Successfully. Click on Contact1.xls file to open it. Select Save As option to save it on your device or memory card location. however if u want to view the file you will have to purchase full version by paying 250 rs. so lame. 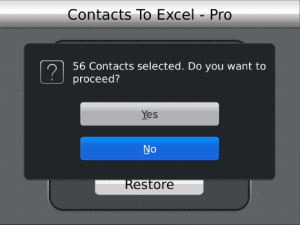 its better to manually take down your contacts than to use this software.